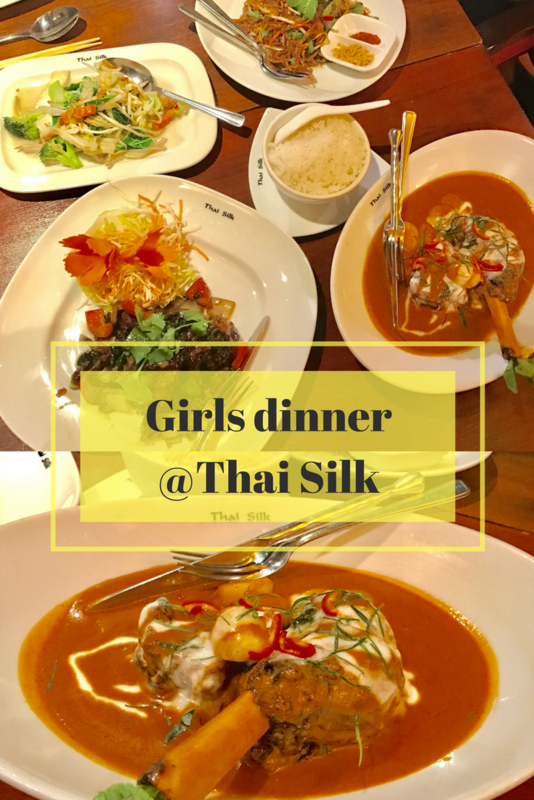 Girls dinner @ Thai Silk - What's Katie Doing? 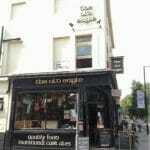 Where do you eat in the hinterland between Waterloo and London Bridge? Well tucked away behind Southwark station are a row of restaurants and bars in the arches under the railway line. 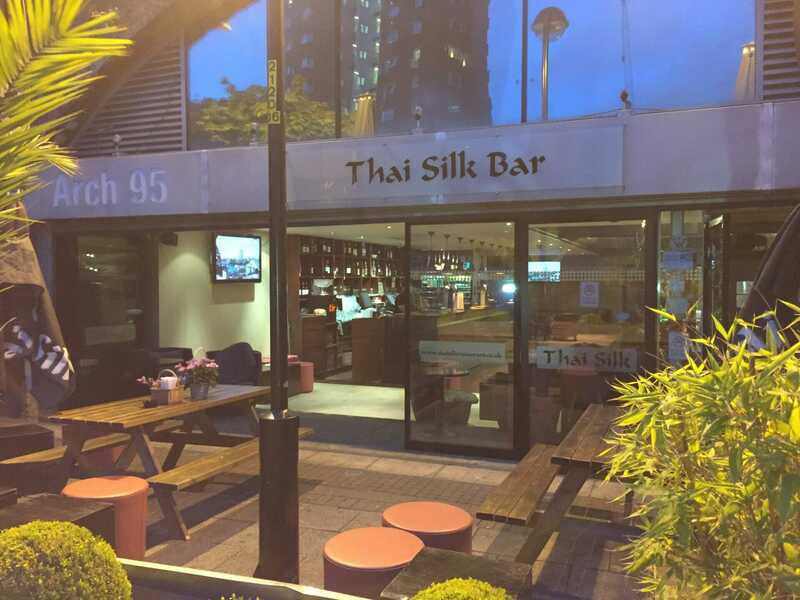 Thai Silk is situated here on Isabella Street, a couple of minutes walk from Southwark Underground or 10 minutes from Waterloo Station. The pedestrianised area has lots of outside space for tables. Not great at this time of year, even with the heating, but come Summer this place is heaving! 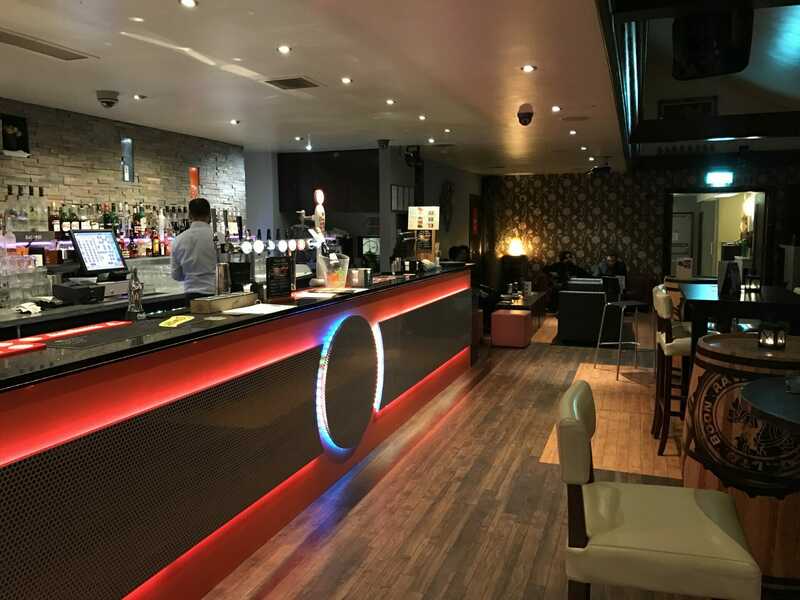 The bar area, light up with funky lighting! 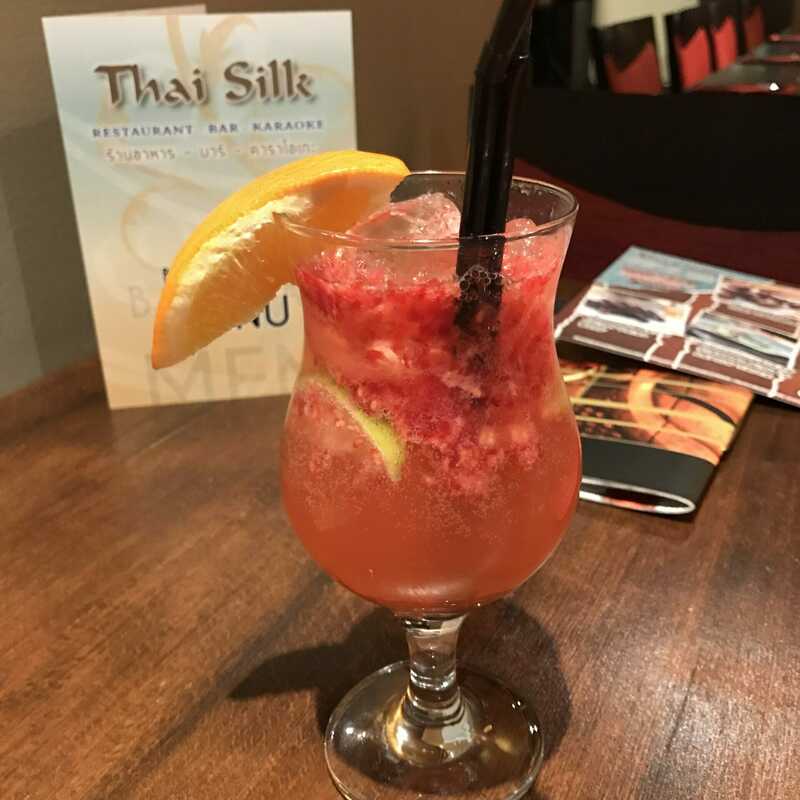 Thai Silk has a large bar area for drinks, a substantial restaurant area and even a couple of private dining/karaoke rooms! (More on those later!). Every Friday and the last Thursday of the month the bar has a DJ so it gets packed with people drinking and dancing. But the food is obviously the star of the show! I love Thai food, at this time of year the comfort of a coconut curry sauce and in the summer the refreshing salads with zing and a kick of chili. 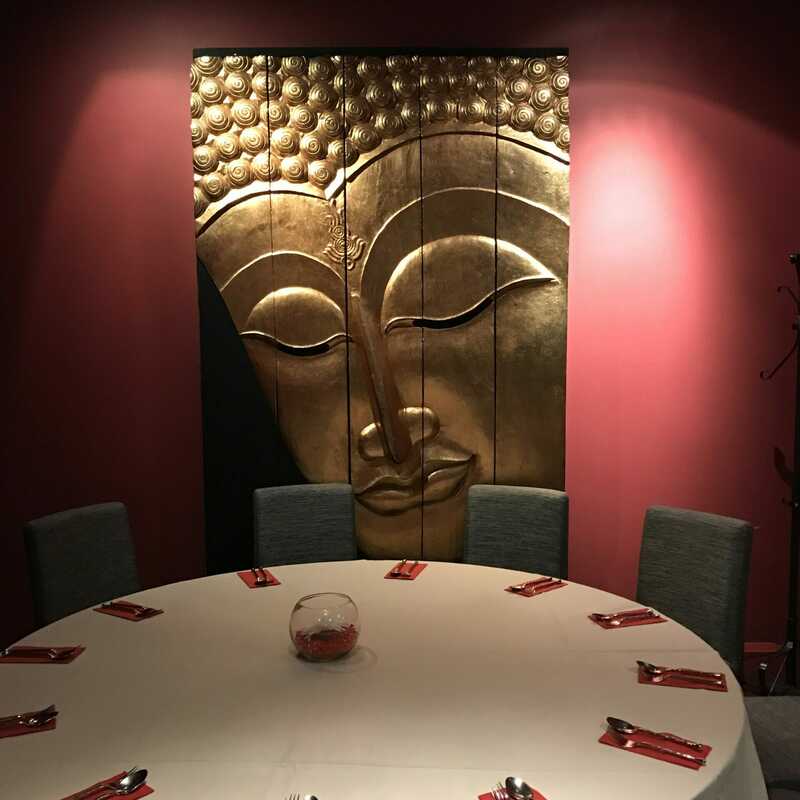 The main restaurant area, in signature dark wood and red, decorated with Thai carvings. 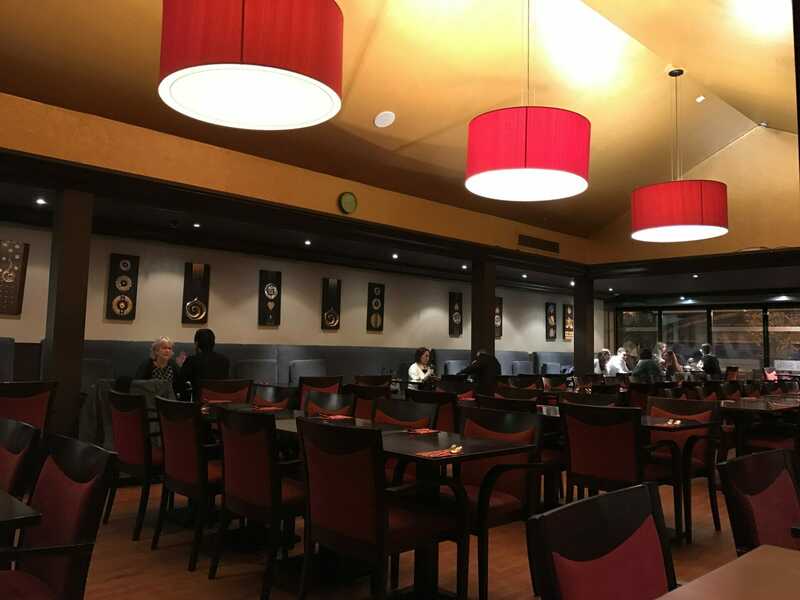 The restaurant area is in the next railway arch – connected to the bar, but also separated, so on a Friday night when the DJ is on it doesn’t get too loud. 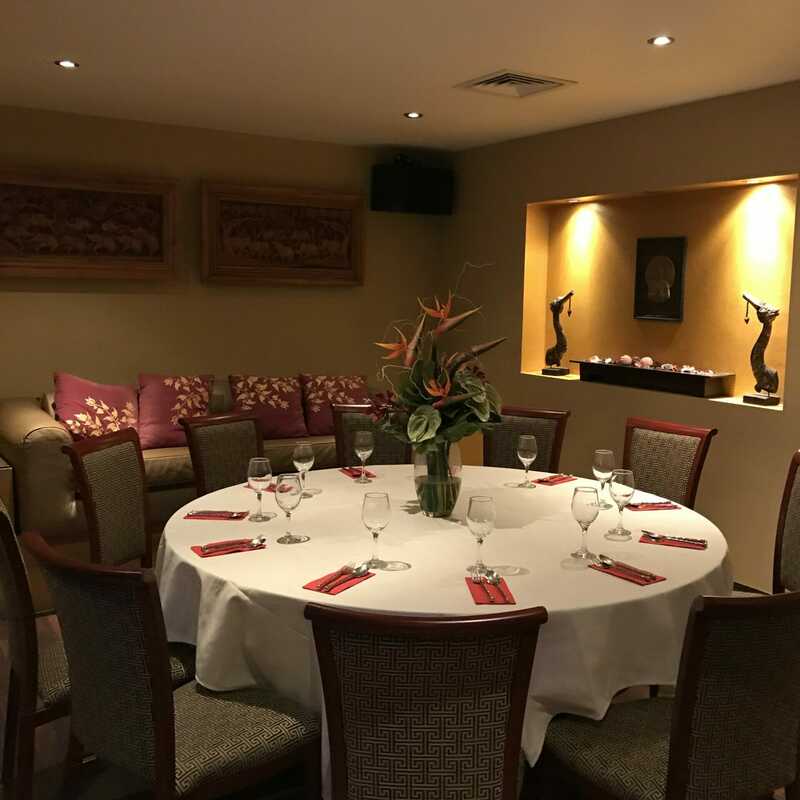 There is plenty of space for larger group tables as well as cosy tables for two on the banquette seating around the outside. 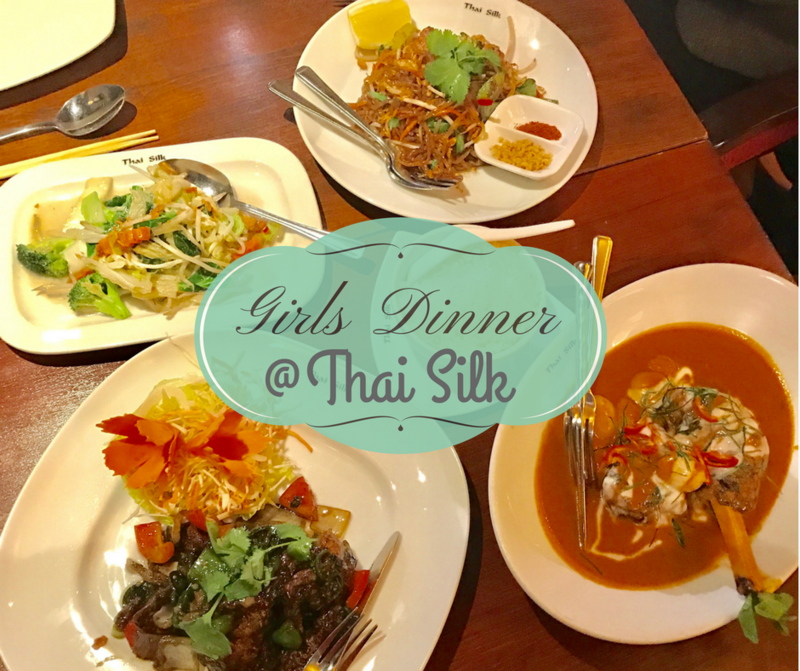 Thai Silk have a lot of unusual signature dishes, so of course we had to try them! 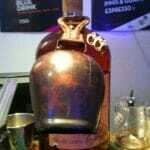 Is your mouth starting to water yet?! T and I wanted to try out a bit of everything, so rather than order individual dishes we went with the set menu. 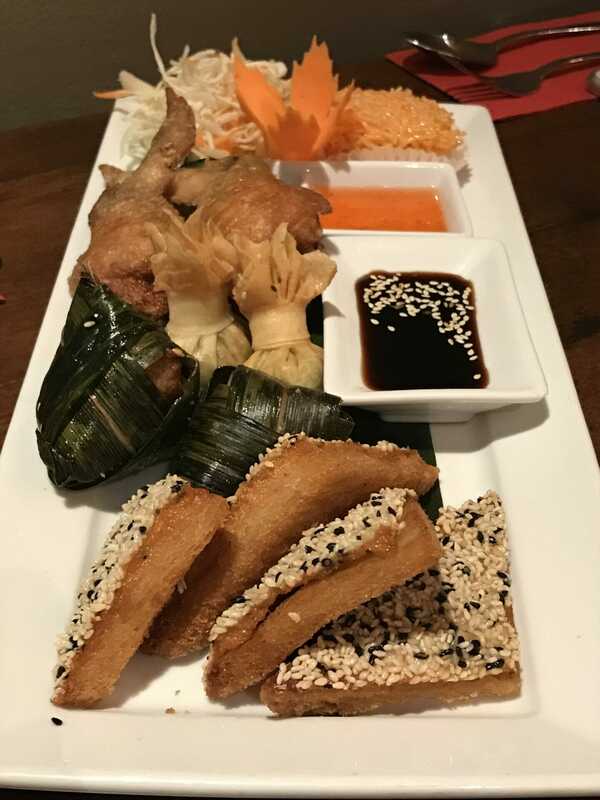 The stuffed chicken wing was a great combination of the crispy outside and chicken skin with a filling similar to a chicken spring roll. 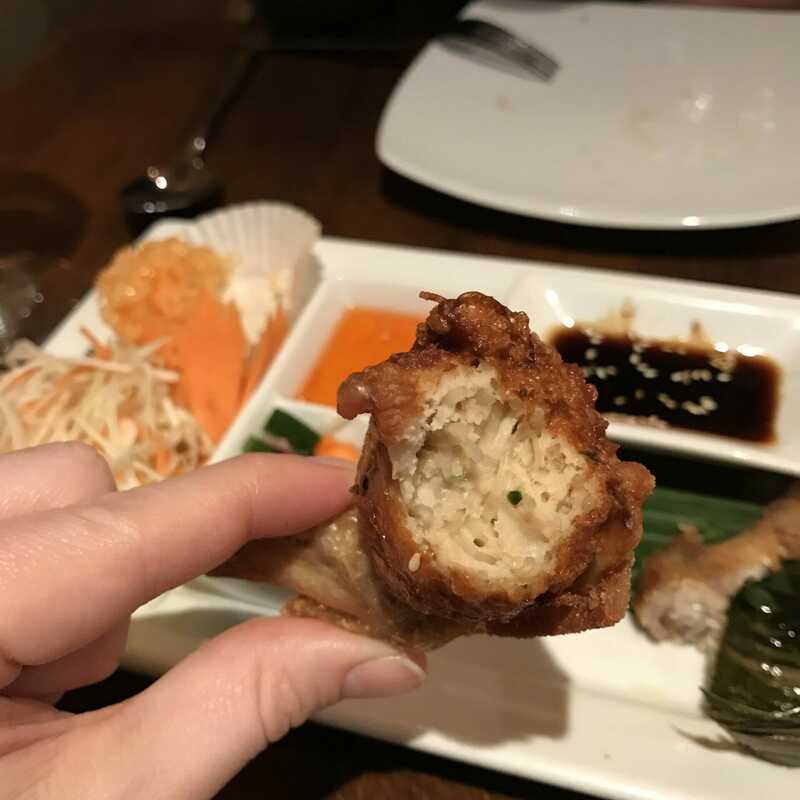 I’d never tried stuffed chicken wings before, so that was something different. The winner of the starter though was the steamed chicken parcels wrapped in pandan leaves. These were super juicy, the leaves keeping the moisture in, very traditional and something else I hadn’t tried before! Our menu included a soup course, which I wouldn’t normally go for if ordering separate dishes, so it was good to experience. 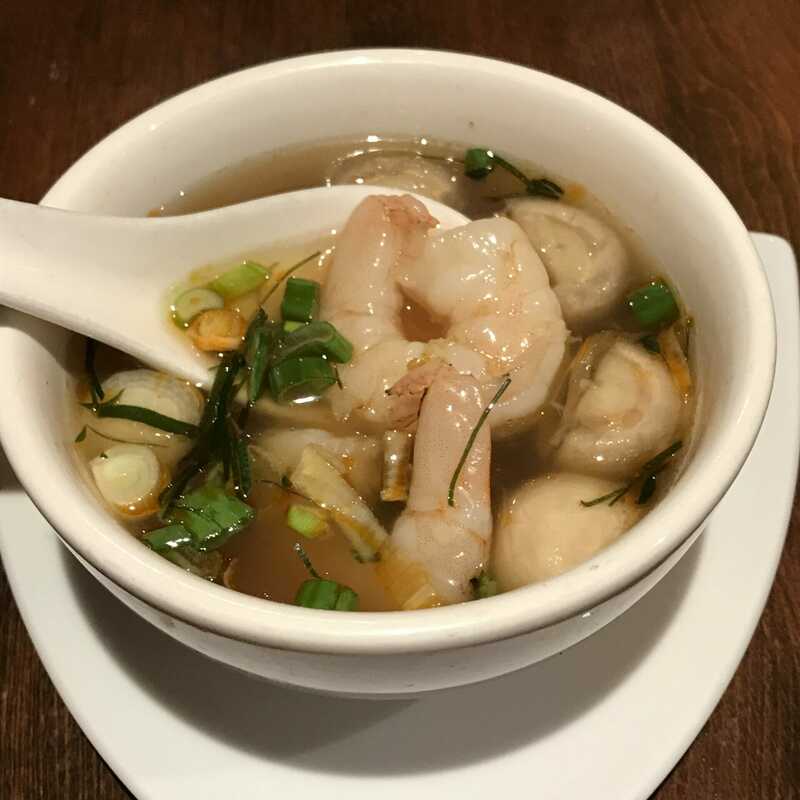 We had the Tom Yum Koong – hot and sour soup with prawns and plenty of kaffir lime leaves. 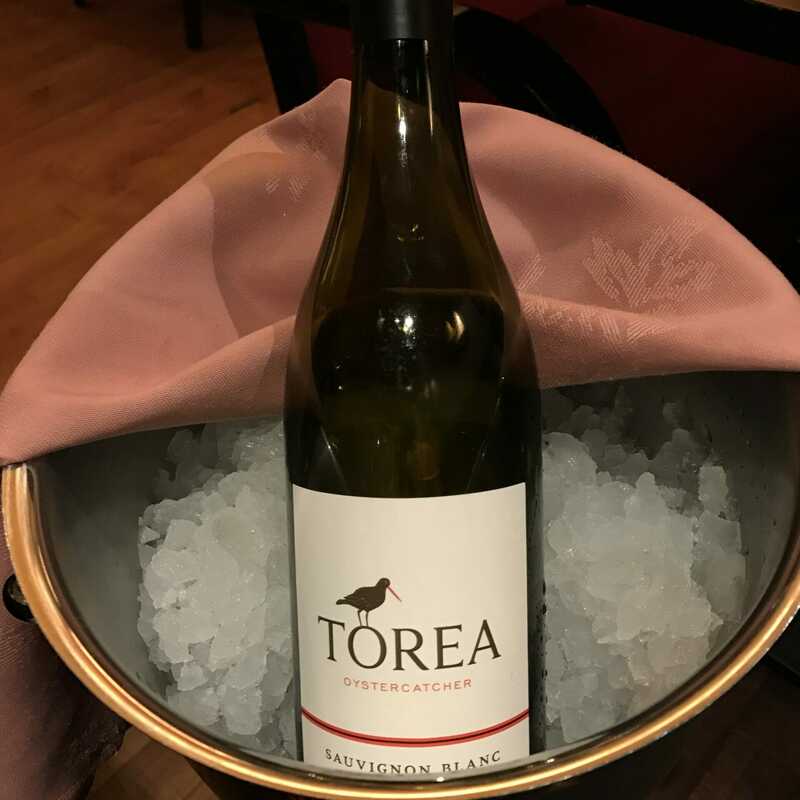 It certainly packed a punch in the taste stakes! The soup was fragrant and tasty, but I was starting to sweat from the heat of the chillies. This is how you know this food is traditional Thai! 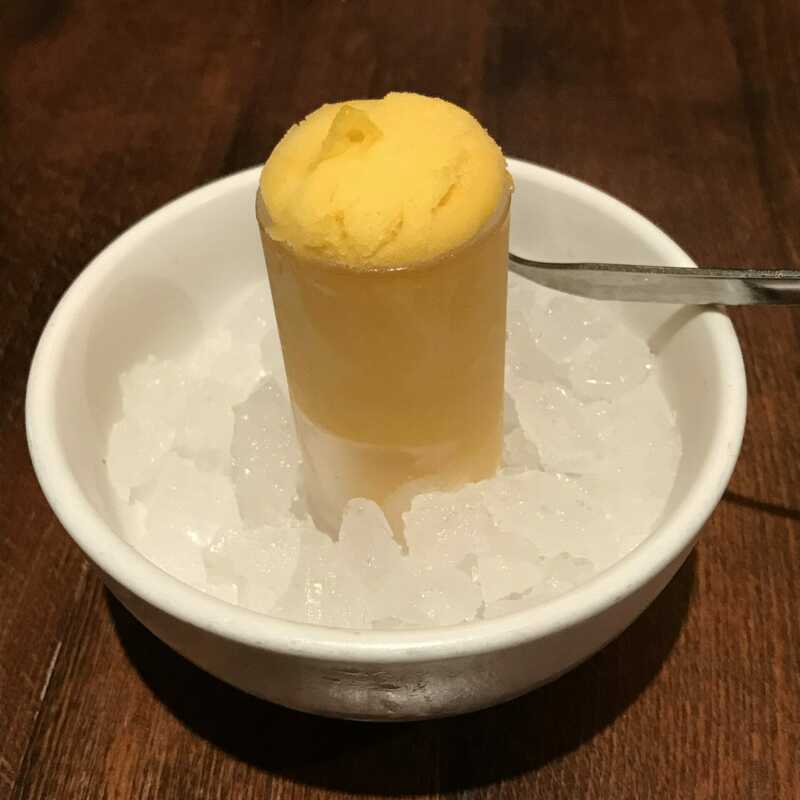 The mango sorbet (my friend had the lime) was the perfect antidote to the heat from the soup. Ideally placed to allow you to continue the meal. 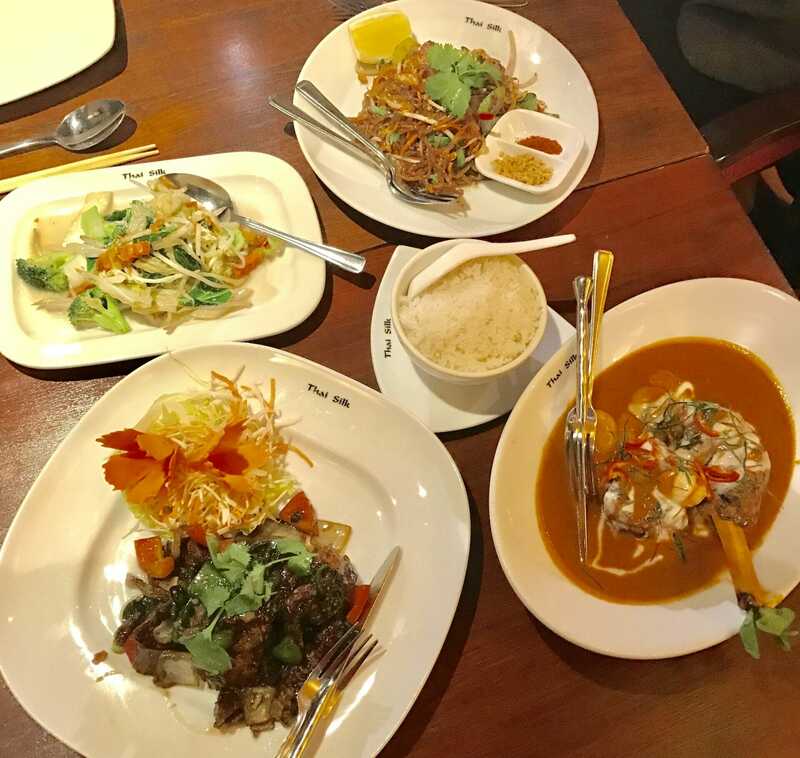 Our menu let us select 2 main dishes to share for the main and came with rice, seasonal vegetables and vegetable Pad Thai as accompaniments. We selected the two main ‘signature’ dishes that intrigued us the most. Panaeng Gae. Lamb shank cooked in a Massaman curry with potatoes and coconut milk. The lamb curry cooked on the shank interested me. I’m not normally a fan of lamb, but the method of preparation for this was something different. 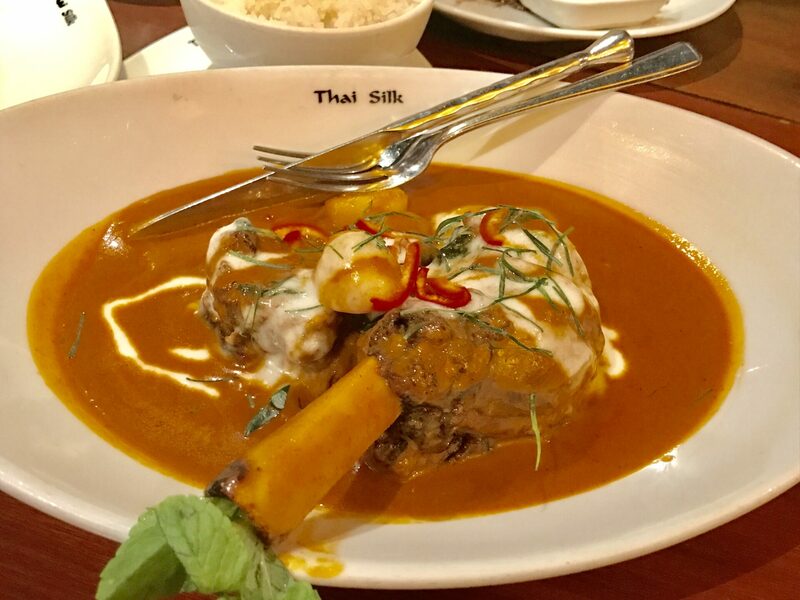 The meatiness of the lamb suits the coconut and spice of the Massaman sauce, a perfect combination for a warming comforting dish in winter. I loved the flavours in this dish, going back for spoonfuls of sauce! 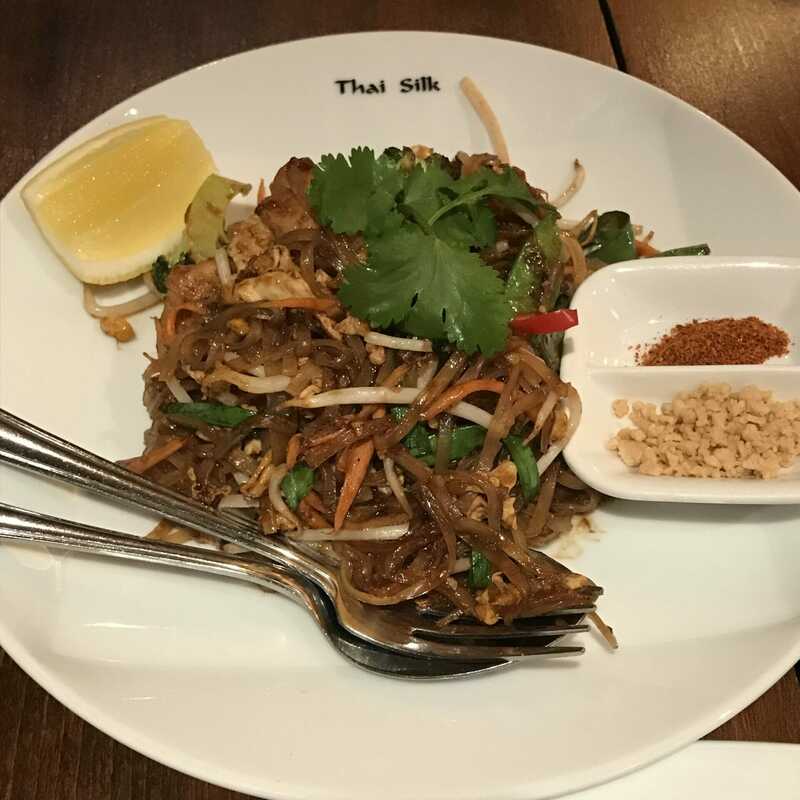 We also chose another signature dish, Poonim Phad Prick Thai Dam. Aka soft shell crab in a black pepper sauce. Soft shell crab is not something that you see that often in London restaurants, so I wanted to order this too! I didn’t think this dish worked as well as the lamb one. When I envisaged the dish I thought crispy battered soft shell crab with a dusting of spice and some veggies. However the black pepper sauce was saucy (what a surprise! ), which meant that the crab was not crispy. As such the dish was not as light and delicate as I’d hoped. 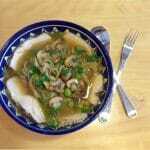 It was still tasty, but the sauce would suit something more robust, like firm fish or chicken. Close up of the vegetable pad thai. I love how it is served with the nits and chili on the side so you can customise. This was a side dish in our menu, however they have prawn and chicken pad thai as main options. By now I was stuffed! However our set menu included a light dessert of a mixed fruit platter and vanilla ice cream. Other choices on the menu included fritters, pandan pancakes (try saying that quickly!) and banana in coconut milk. As we were stuffed I took some of the fruit home for a snack for the next day. Apparently Thai Silk are hoping to start a delivery service soon… watch this space. An extra bonus is that Thai Silk offers karaoke rooms! 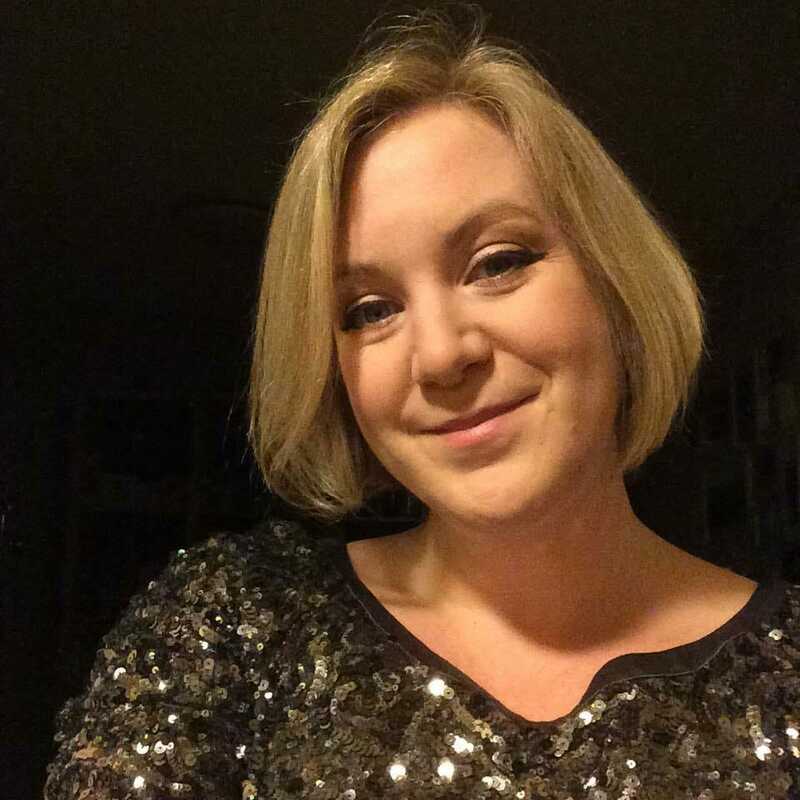 I do love karaoke and finding nice venues that have space for a group, so something to consider in the future. The Queen room can host up to 40 people buffet style. The room has 3 screens to show the karaoke. With less people you can do sit down meals too, this room is popular for baby showers. The King room fits 16 for a sit down dinner or 20+ for karaoke. This room is great for work lunches too! The karaoke system was belting out Adele when I was there, they have lots of songs on the system! 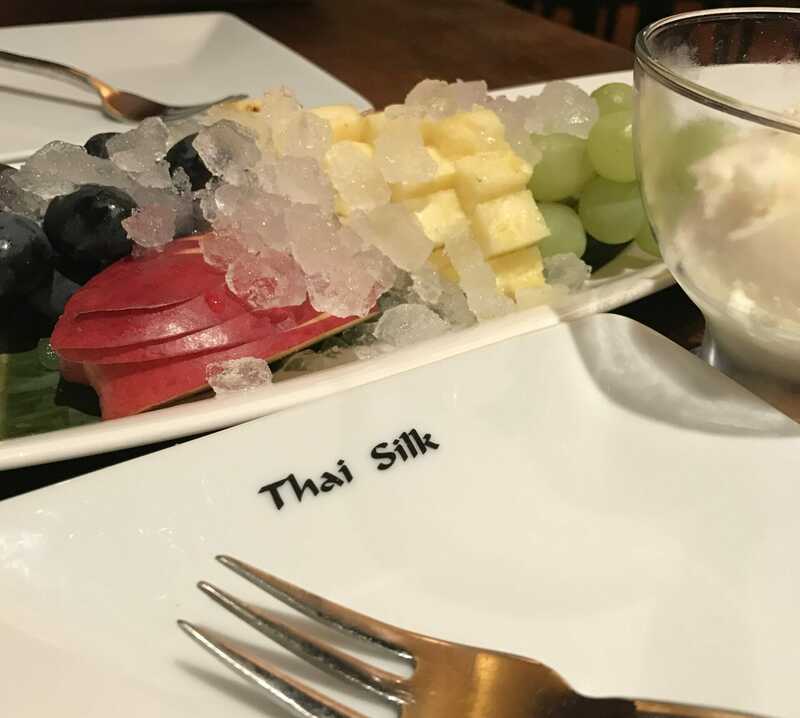 I enjoyed my meal at Thai Silk immensely. 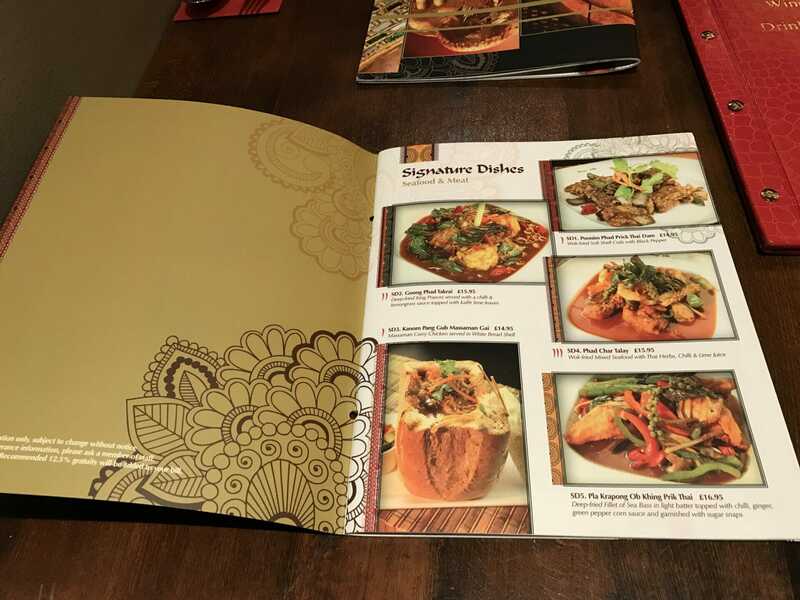 As I love trying new things, finding a menu that combines traditional and twists on the traditional is perfect for me! I appreciated the things I’d never tried before using traditional cooking methods, such as the chicken in Pandan leaves. The twists on the traditional in the signature dishes keep the food interesting. My favourite dish was the Massaman Lamb Shank, but I still want to go back to try the authentic papaya salad and their new street food menu! 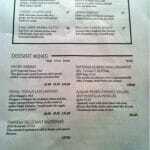 Full disclosure, I was a guest of Thai Silk for dinner, however all opinions are my own. The food here looks unbelievable. I am a big fan of Thai food and it is my go to almost always. I am also not a huge fan of lamb but would you say the Panaeng Gae was better than the vegetable pad thai? I love all Pad Thai.